As a kid, I spent a lot of time at grandma and grandpa’s house. In fact, the very first memory that I can reach back to in my mind is sitting at their kitchen table eating macaroni and cheese. I had many wonderful memories at grandma and grandpa’s house. I remember playing in the backyard with my cousins, mowing the lawn, riding my bike around the neighborhood, working on our treehouse and spending time with grandpa in the garage. When I think of grandpa three words come to mind. Kindness, presence, and curiosity. Kindness. I don’t know if I’ve ever met someone as genuinely kind as my grandpa. He is everything that you’d want in a grandpa. Tender, approachable, knowledgable and safe. Many of my best qualities as a father come from watching my grandpa and spending time with him. I don’t know if people would describe me as kind, but I want them to. I aspire to be known as kind like he was kind. Presence. I can’t recall any deep conversations that I had with my grandpa. I’ve enjoyed a lot of those type of conversations with my dad and my other grandpa over the years but with Grandpa Henry, what I remember most is spending time with him. We spent so many countless hours in his garage, in the backyard, or on the road to restock candy machines. I remember always wanting to spend time with him as a boy, and I think that goes back to the kindness that he exuded. His kindness made me want to spend time in his presence. In my position as a chaplain working with first responders, one of the most important roles that I play when I show up to a scene filled with trama and crisis is to practice what we call the “power of presence.” Often chaplains don’t have a significant impact on those in need with the words we say but rather with the calming and stabilizing presence we bring. When I think of my grandpa, I remember his presence bringing calm and safety to my young heart. I believe the power and impact of his presence on my life continues on in the way I minister to people in crisis today. Curiosity. I know this word might sound out of place from some of the other words that I used to talk about my grandpa but bear with me. As a little boy, my grandpa’s stories of working on various spacecraft thrilled me. I wish there were a stronger word I could use than thrill – his stories ignited my imagination. I remember looking up at the night sky with him as he pointed out the constellations, I also remember watching old classic episodes of Star Trek with him and I remember the time he took me to my first Sci-Fi convention. My grandpa not only ignited my imagination and curiosity, he encouraged it. I am incredibly grateful for the wonderful gifts of kindness, presence, and curiosity that he gave me. Lastly, I want to share a story about working on a car with my grandpa. I graduated high school in 2004 and grandpa and grandma came up to Washington state, where I lived for the celebration. That whole school year I spent every spare moment I could up in the mountains or down by the river off-roading with my 1989 Jeep Cherokee. I loved and abused that jeep. I sent it soaring through mud puddles and up trails that I had no business taking it. My jeep had the side door panels dented from scraping up against and even sliding into tree trunks. The result was a pockmarked vehicle that resembled the surface of the moon. Do you know what my grandpa did for me that week he was visiting for my graduation? He opened up the inside of the door panels and banged out every dent he could, then he sanded down every square inch of the surface of that jeep, and then he applied a fresh coat of paint to it. All of this took a lot of hard work and I did far less than my fair share of the labor. How many times do you think I took that jeep off-roading after all his hard work? ZERO times. I was on cloud nine. He might as well have given me a brand new car. I was SO happy. That jeep became more than just my first car. It represented a labor of love, a precious gift. I’d go on to take my wife out on our first date in that jeep and I’d drive it the night I asked her to marry me. 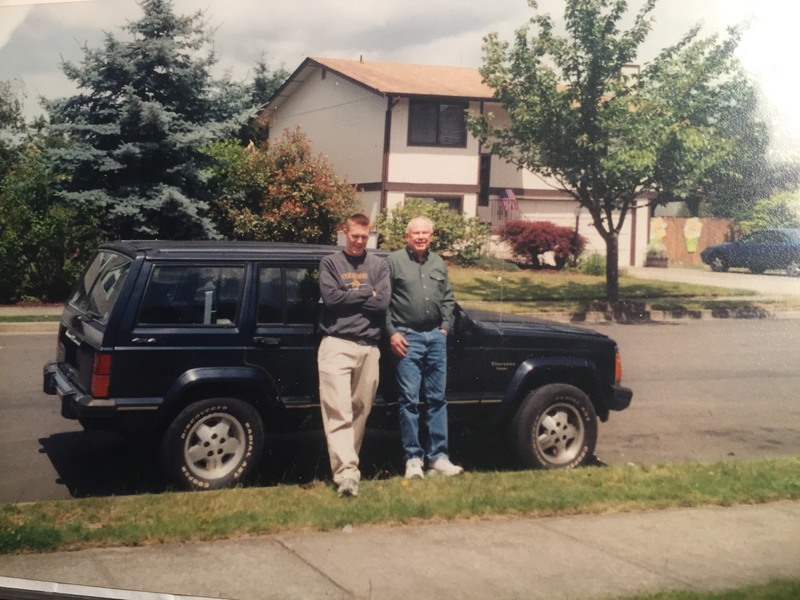 I sold the jeep years ago but the memory of what grandpa gave to me is deep in my heart. When I got to town a few days ago, my mom and grandma found a picture of the two of us standing next to the finished product after all his hard work. I will cherish that picture forever. For all of this and so much more, thank you, grandpa. I always looked up to my daddy. Even though he was not large in stature, he was always a giant of a man in my eyes. Being his favorite child, I have many fond memories of him. Some of my first were of him coming home from working at Martin smelling of DoubleMint gum. He always had a big hug for us and some gum in his pocket. I especially loved it when he had Juicy Fruit. I also have fond memories of our camping and fishing trips together as a family. I remember a particular time he woke me up very early in the morning in our tent to go fishing with him, just the two of us. We had lots of fun fishing experiences at lakes in Colorado and other states, catching trout and even catching sea-catfish and trying out sailing a sailboat together when we lived in Florida. But as much as I enjoyed fishing, I loved being with my daddy even more. While on those camping trips he also made sure we attended a church service if we happened to be vacationing on a Sunday. Sometimes it would be a campground service in an amphitheater, and other times we would just find a church along the way that either said SBC or looked like it could be. Sometimes that made for an interesting experience , like the time we wandered into a Mormon church and they heard dad’s voice and asked him to lead the music. He politely declined, then not wanting to offend anyone, we stayed a while, then quietly slipped out. In our backyard on Perry Street in Denver, ever being the protective father, he climbed up our favorite tree and put thumb tacks to the height where we could climb and not be too close to the electrical lines. At that same house, dad built me my own room in the basement. He let me help plan it and help him build it. He was pretty handy that way. I felt pretty special having my own space, until one of my sisters (Cynthia), decided to come bunk with me! When our church, Brentwood Baptist in Denver, relocated and renamed to Lochwood Baptist, we also bought a house and moved to Lakewood. Before our house was completed though, dad would drive us to our new schools each morning. I had a later start time, so dad and I would go early in the mornings to help work on the church building before he took me to school. We could see our handiwork all over that building, and boy was dad proud he could help in the process. And I felt pretty special to get to spend that time working with my dad. When I was in high school and had my first job at Woolco, dad became my knight in shining armor. One weekend I was working the manual cash register in the garden department. It was a very busy Saturday and we were told we couldn’t keep large bills in our drawer. So, I called the office for them to bring me change. You could only open the drawer if someone was making a purchase, so I pulled out the bills, and waited for the change. Only problem was, the one who was supposed to bring my change got busy and never came. I decided to put it in my pocket until they came. My shift ended, and I went to the High school with my boyfriend to go to a play. After the play while walking home, I put my hands in my pocket, and was devastated to discover a hundred dollar bill and a fifty dollar bill! I quickly returned home and woke up my parents in hysterics. I think they probably thought I’d been in an accident or something. Dad calmed me down, and assured me he’d go with me to the store in the morning and it would all be alright. Well, we got up early the next morning, and met the manager at the door. Dad explained everything, and of course, everything worked out. I think my boss could just tell by my ashen face and my dad’s calm demeanor that he should trust that what he was telling him was true. They hadn’t even discovered the discrepancy yet and dad’s honesty and integrity won the day. ‭‭Daddy lived out that verse every day of his life. He was a man of dignity, honor, loyalty, faith, and gallantry. 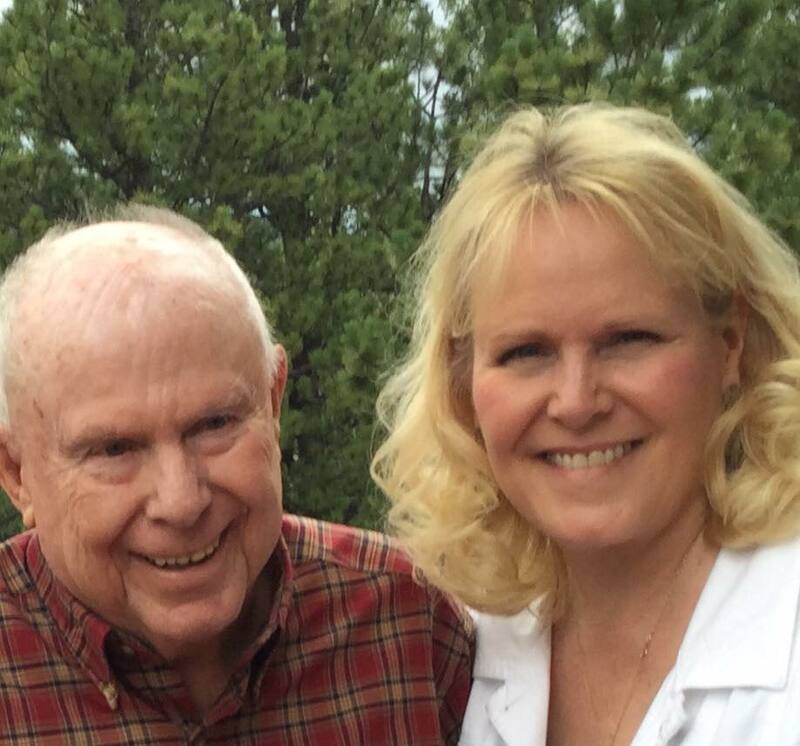 I will miss him each and every day, and look forward to seeing him again in heaven. I may not really be his favorite child, but he is my favorite daddy. This entry was posted in Uncategorized and tagged Jim Henry. Bookmark the permalink. Both beautifully written. He left quite a legacy and we get to love and appreciate it as they, members of our family, live it out. He was one of the nicest men I have ever known. I thoroughly enjoyed reading both of these remembrances. Thank you for posting them. Both of these testimonials moved me. Now, I’m sorry that I never got to know Jim Henry.